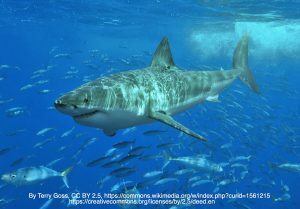 Jaws – A Hollywood Horror For Marine Life? Jaws ; it’s one of my all-time favourite films since I was first allowed to watch it at my 13th birthday swimming party. I’m not entirely sure what it is about the film that captured my imagination, but I do know that I found the shark fascinating. Up until this point, cetaceans had always dominated my interests with posters of orcas and dolphins lining my walls, but after watching ‘Jaws’, it wasn’t long before sharks joined them. The film didn’t scare me, it didn’t make me hate sharks, it made me want to learn more about them. I wanted to know about the habits of great whites, what they eat, where they live as well as all the other sharks swimming in oceans around the world. This was my response to the film but sadly, it didn’t have the same effect on everybody. Films can have such an impact on people, often influencing the way we approach situations – people and even animals, and when Jaws was released in 1975, attitudes towards sharks changed overnight. Based on Peter Benchley’s novel Jaws which had been published the year before in 1974, the film depicted a murderous great white shark stalking the beach and the people of Amity Island and killing multiple people. The shark seemed to have a motive – all it wanted to do was kill and wreak havoc on an innocent beach community and it was this which seemed to provoke people into taking action. A “kill before you’re killed” kind of approach. So much so that in Florida, shark tournaments were set up for people to head out to sea and hunt the fish they felt posed such a threat to them. Dozens of these hunting events were organised which ultimately lead to the shocking decline of sharks in the area. In the decades that followed, off the eastern seaboard, some species populations dropped by 50% and even more worryingly, others declined by up to 90%. Between 1986 and 2000, great white populations declined by 79% according to research by biologist Dr Julia Baum; a sad and undeserved fate. Of course, this wasn’t entirely down to these hunts, commercial fishing and shark fin soup played a significant role in this decline, however attitudes had changed. Sharks were no longer mysterious, they were killers. But is there any truth in the story of a revengeful shark? The short answer is no. Before Jaws the book was released, a great white shark had caused havoc in 1916 after attacking swimmers in New Jersey. The book was loosely based on this with the added factor of the shark being determined, focused with a drive for human flesh – this is truly not the case. Shark attacks account for approximately 10 deaths a year and these are mainly by great white, bull and tiger sharks. There are a few reasons as to why these attacks may occur but none of them include the idea that they do it just because they want to. They may mistake us for prey, drifting on the ocean’s surface like a tasty seal or they may even take a little nibble to see if we taste any good. They might also bite as a way of telling humans to leave their area after having had their previous warning behaviour ignored. Sharks don’t want to eat us, they don’t attack for no reason, they want us to stop intruding. So, Jaws has definitely had a negative impact on our attitudes to sharks and that seems to be partly down to our own misconceptions. Those two familiar notes from the theme tune still strikes fear into the hearts of many people and I know a couple of people who still aren’t happy going in the sea, even where there are no sharks! It is, however, important to recognise that some good did come out of the film; the increase in shark research. When shark numbers started to dramatically drop, scientists discovered a gap in their knowledge about these fish. Prior to the public reaction, sharks were just not interesting enough for anybody to even consider funding research into them. They were mere pests who occasionally got in the way of fishermen. But with so much interest in them, research increased and more was learnt about what drives them, their biology and even how shark attacks could be avoided. We now know that overfishing and human activity is driving sharks closer to our coasts and that, combined with the idea that more people are swimming in the oceans, could be why more people are attacked. The sharks don’t want us, they want their habitat back. Jaws has had both a positive and negative effect on sharks. They were killed as a result of our own misconceptions and numbers plummeted but we also learnt more about these mysterious animals. Peter Benchley himself learnt more about sharks and began campaigning to save them when he discovered that much of what he had written about was not true. Nevertheless, attitudes towards sharks are changing. Perhaps it’s because we have more access to videos and information showing the truth, or perhaps that statistics of attacks don’t support this idea of a fish hellbent on revenge. Either way, with the shark genre still a strong contender in the film industry, it’s important that people don’t believe all they see and I’m glad to see this approach is growing in strength. The effect of mainstream films on marine life is not clear cut. They may have some good effects, and some bad ones, and these effects may change over time. Some films like The Cove, are obvious in the messages they are getting across and other more light, hearted, entertainment-centric films are not. I think what is important is that we, as individuals, are able to utilise the resources we have available to us and separate fact from fiction. With such easy access to information nowadays, it’s easy to see that sharks don’t hold grudges and that dolphins don’t enjoy being forced to perform. It’s our responsibility to make the connection and separate what has been created for entertainment from what truly happens in the watery world.